During the First World War, it wasn’t uncommon for young men to add a year or two to their age in order to get into the army. Quite a number of eager Grande Prairie boys lied about the year of their birth so that they could enlist, in spite of being under 18. Fred Blanchard lied about his age too – except that he made himself out to be younger so that he could join up in July of 1915. Fred was born in Hampshire, England on March 6, 1862. He joined the British navy in 1878, only 16 years old, and served for nine years. His first military service was in Egypt; in 1882 he was presented a bronze medal for distinguished service by the Khedive of Egypt. From 1885 until 1887 Fred served with the navy in Burma, where he once again won a medal for distinguished service. Later in his career Fred was engaged in chasing slave traders along the east coast of Africa on board the HMS Turquoise. He left the navy with an honorable discharge around 1871 and, for a change of career, joined the Metropolitan Fire Brigade of London. 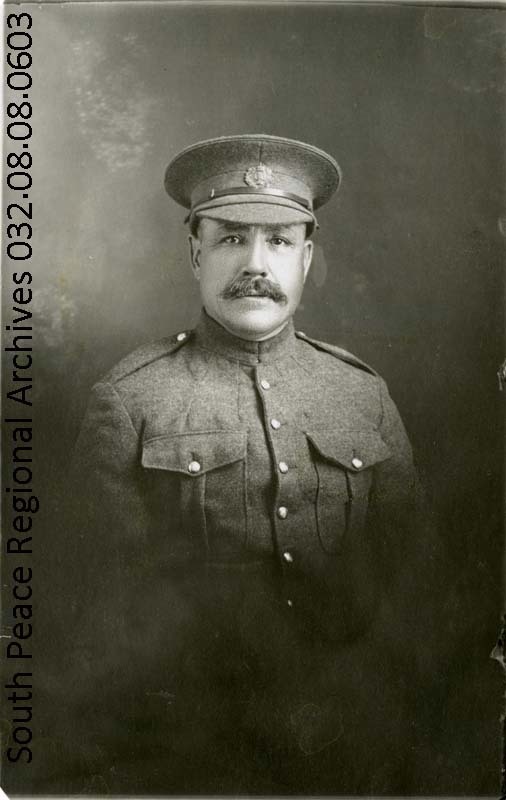 In 1909 Fred came to the Peace country. His wife Emily and their children joined him in 1910, and a year later he filed on a homestead at SE 17-72-7-W6, on the east side of Lake Saskatoon. His loyal service was still remembered at the end of his life. Fred died on March 15, 1930 and was buried with full military honors in the Soldiers’ Plot at Hope, British Columbia.